The game was Double Trouble. Mr. Swartley made an innocent challenge to his physics class and Team 332 was founded – a grassroots movement to say the least. Funding was aquired, mentors identified and encouraged to join. Without knowing exactly what they were getting into, an adventure was born. The team designed, built, and programmed the robot. Success was achieved – it worked. There were no regionals at that time. Every team traveled to the FIRST Robotics Championship Event in Florida. The pits and competition fields were located in tents in the Walt Disney World Epcot Center parking lot. 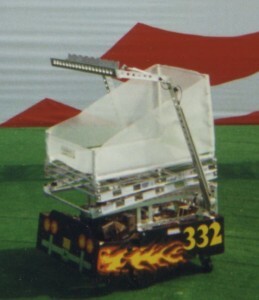 Double Trouble was the 1999 FIRST Robotics Challenge game. Alliances score points by positioning “floppies,” their robots, and a “puck” on the playing field. “Floppies” are light-weight, pillow-like objects with Velcro-loop material located in its centre and around its perimeter. The “puck” is a short, octagonal platform that rolls freely on castor wheels. Around the perimeter of the field are four stations for human players, who may throw floppies to each other or onto the playing field. Four floppies per alliance are located on the playing field. The floppies are color-coded to identify alliance ownership.